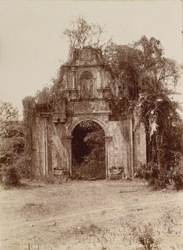 Photograph of the entrance gateway to the Citadel of Bassein, Thana District of Maharashtra, taken by Henry Cousens taken by Henry Cousens for the Archaeological Survey of India Collections: Western India 1897-98. Bassein, situated 45 km north of Bombay, is an old fortified Portuguese city which prospered from 1534 to 1739 after the Portuguese took the city from Sultan Bahadur (r.1526-37) of Gujarat. During this period the citadel was inhabited by Portuguese nobles who built many churches, convents and houses.